Perfect for practice, because practice makes perfect — The Ashdown Tour Bus range. 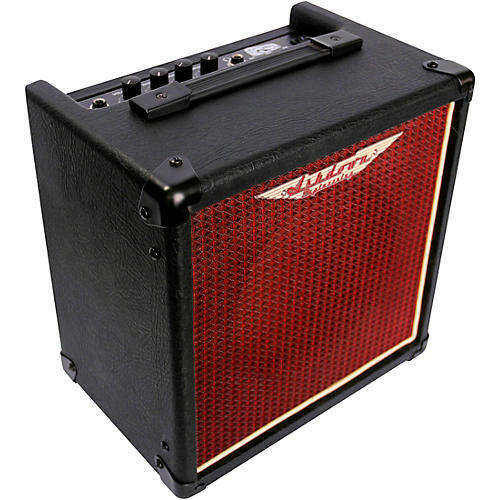 The Ashdown Tour Bus 15 packs essential features into a compact box with a 15-watt power amp and 8” speaker. This durable little driver packs a punch, delivering a surprisingly compelling volume from such a small unit and provides a little more head-room than it’s smaller sibling, the Tour Bus 10. The Ashdown Tour Bus 15 keeps it simple and gives you everything you need to get started. The Tour Bus 15 features a straightforward volume and 2-band bass & treble EQ controls - making it easy to get a great sound time after time. A headphone socket allows for silent practice, whilst the CD/MP3 input means you can play along with your favorite tracks. The Tour Bus 15 has features a premium heavy-duty buffalo Tolex covering with a stylish and distinctive vintage red grill. The Tour Bus 15 is great for Tour Bus jamming and a handy little tool for ‘on the go’ practice or an amp that wont take up too much space in your living room. Dimensions: 12.8" x 23.6" x 17.9"